Don’t forget, it’s time for for Round Four! The April ENCHANTED ARC Giveaway is here! Alethea will be giving away one signed ARC of her YA debut fairy tale novel ENCHANTED a month, until the May 26th launch of the book. That’s one for January, February, March, and April–a total of four ARCs. In May, Alethea will be giving away a signed finished copy of ENCHANTED, along with A SIGNATURE NECKLACE from her sister Soteria’s Fairy Tale jewelry line, which will simultaneously be launched at Dixie Dunbar Studio on May 26th. Come one, come all — the more the merrier! 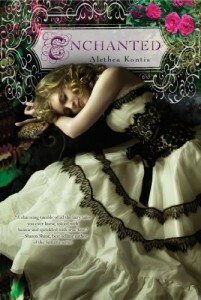 Enter to win one copy of ENCHANTED, or enter to win them all! Most importantly, keep reading and sharing the magic! Giveaway ends April 28, 2012. This entry was written by Princess Alethea and posted on April 4, 2012 at 7:00 am and filed under Books, contests, Enchanted. Bookmark the permalink. Follow any comments here with the RSS feed for this post.